Excited for Absolution? 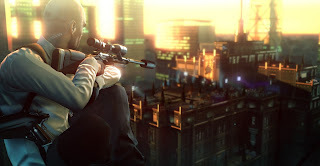 Check out the Hitman Sniper Challenge! Hitman Sniper Challenge is a preorder item you can receive if you reserve the game at GameStop. Once you put down your $5 for the game which comes out in November of this year, you'll receive a code to download this mission. There are no achievements, but you can receive in-game bonuses for the full game, as well as increase your score to increase your rank on the leaderboards. In this mission, you'll play as Agent 47 atop a roof as you snipe specific targets attending and running security at a rooftop party. You'll have 15 minutes to get the job done, and depending on how you play, extra points can be rewarded. There are also challenges to be unlocked and completed, and once you finish them they add a permanent point increase to your multiplier.